Have your child or children kick off the New Year with confidence and a new skill set on January 8, 2017 at 12:00 pm. 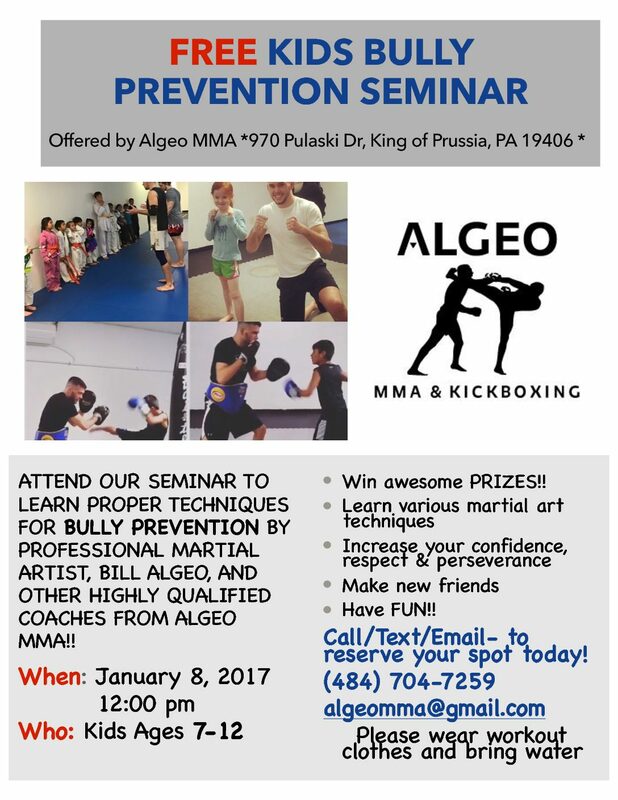 Algeo MMA and Kickboxing is offering a FREE Kids Bully Prevention seminar, for children ranging from 7-12 years old. It is being held in the heart of King of Prussia, directly across from the King of Prussia Mall. Kids can enjoy a fun and safe atmosphere as they learn valuable techniques of how to handle confrontation. The seminar will be taught by professional MMA/Muay Thai fighter Bill Algeo(who is a black belt in Brazilian Jiu Jitsu), with the support of highly trained assistants. Kids will learn how to defend themselves in the event of an unforeseen attack using various martial arts like Boxing, Wrestling, BJJ and Muay Thai. Instruction will focus on using these skills while increasing each child’s confidence, respect, and accountability. There will be prizes, giveaways, games, and the opportunity to make new friends! Just call or text (484) 704-7259, or email algeomma@gmail.com to reserve your spot today! One of our favorite ab exercises here at Algeo MMA. Mix in every elbow you know while trying your best to keep your heels off the ground. We have had countless success stories of people losing a ton of weight while gaining functional strength. Come burn off the weight from the holidays while taking any of the martial arts we offer here in King of Prussia. 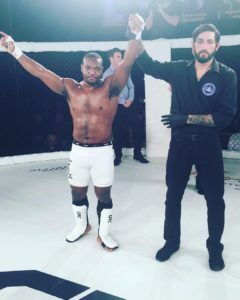 The future looks bright for rising star Dan Tolbert, as the former college wrestling standout at Lock Haven University won his 3rd straight MMA fight via Unanimous Decision. He took on a tough, game opponent in Andre Petroski, who was undefeated as well and had a huge crowd there cheering him on. Tolbert, aka Chocolate man(a nickname he recently received while training Muay Thai in Thailand at the prestigious Sityodtong Gym), did not let the unwelcoming crowd steer him from his goal. Dan looked calm, composed and like a seasoned fighter throughout the entire fight. Round 1: Mostly a feeling out process in the first minute, with both guys trying to get their range down. Dan landed some nice leg kicks, and Andre did a nice job of controlling the cage. With 30 seconds left in the round Dan caught a kick and took him down with a impressive slam and then controlled on top as looked for a triangle set up. Round 2: This round was all stand up with both guys having their moments. At one point they both connected on each other and both guys smirked and touched gloves afterwards. Andre landed a heavy cross on Dan and then Dan returned with a cross to the body that looked painful. Close round but Tolbert landed a little bit more. Round 3: Dan started the round of keeping his range well and a looking for some leg kicks. 40 seconds into the round Andre was relentless with a head on the inside single and eventually got the finish with a nice trip. Dan looked a little winded being on his back, most likely an adrenalin dump, but was eventually able to get back up and start looking to strike. Dan gets the nod, with all 3 judges scoring the bout 2 rounds to 1 for Chocolate man. Chris Daukus wins a decision over a tough opponent in an exhausting back and forth battle. Both guys were attacking leg locks and Knee bars which is rare to see from heavyweights. Young Joe Solecki improves to 2-0 after finishing his opponent with a rear naked choke in the first round in under 3 minutes. The young brown belt is making his way up the ranks fast. Mike Pope, a former Algeo opponent, became the 155lb champion last night defeating Pittsburgh’s Mike Wilkins with an extremely tight guillotine choke. Pope ended up thanking Algeo for defeating him back in 2014, because it was the motivation he needed to get better. Sean “Shorty Rock” Santella defeated a game opponent in Matt “SMG” Lazano to become the 125lb champion. Both guys had a ton of people there and it was an entertaining fight. Shorty Rock started to dominate and then secured a rear naked choke to get the Belt. 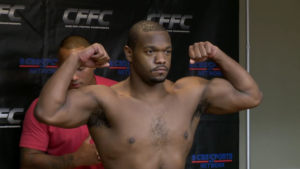 Dan Tolbert will be fighting at Cage Fury Fighting Championships tomorrow night. Dan is already 2-0 and just weighed in at 184.7lbs at the official weigh-ins. Dan has a fantastic wrestling pedigree, as well as excellent Muay Thai and Brazilian Jiu Jitsu. Dan is a former wrestler at Lock Haven University and has been training at Algeo MMA for 2.5 years. Algeo MMA students will be there in full effect cheering him to victory as he goes up against a tough opponent Andre Petroski. Petroski, a former college wrestler himself, is also undefeated and will be the hardest challenge of Dan’s young career thus far. Congratulations to Algeo Mixed martial arts & Kickboxing student Eddie Scott on the past weekend’s Brazilian Jiu Jitsu tournament. Thank you to the good fight bjj touneys to putting on another great tournament. The good fight has a tournament every year in November downstairs from Algeo MMA in King of Prussia and every year we have a great number of students compete. Ed Scott was one of the students that competed in November and he was awarded 2nd place. 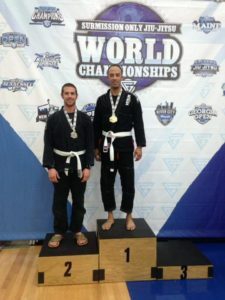 Since he placed at this tourney he was eliglble to compete at the Good Fight Jiu jitsu Worlds. So Ed was going against some stiff competition and he was able to use his athletic abilty and ju jitsu training to finish everyone he went up against with a submission. If your looking to compete in jiu jitsu or just get in the best shape of your life, there’s no better time to start! Algeo MMA is offering a 2 Week free special if you click HERE. Jiu Jitsu, and martial arts in general, is a great way to be productive after work and meet cool and interesting people that could be life long friends. Besides being extremely fun to train, BJJ is extremely effective and can help someone of any size defeat a bigger and stronger opponent. Welcome to the Grand Opening of Algeo Mixed Martial Arts Academy! We are pleased to announce the premier MMA Academy in King of Prussia is now open and taking new enrollments.